Product image of our Cutting Oil. PROBLEM: The cutting oil used in a screw machine shop was heavily contaminated with aluminum metal fines. Every month or so, the company was paying to replace five to eight drums of oil with new and have the contaminated oil hauled off. 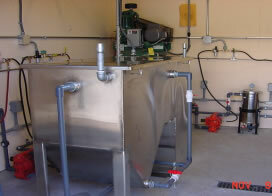 SOLUTION: They began filtering their oil using a Model 130 Portable Filtration Cart. 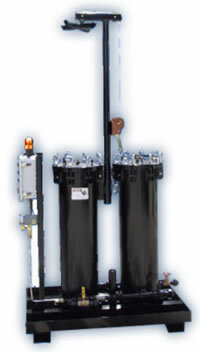 The Model 130 has a single bag filter housing and two depth filter housings. 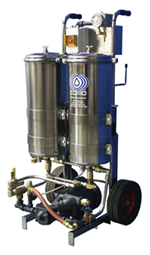 It batch filters the oil and removes all of the metal fines, impurities, and contamination. 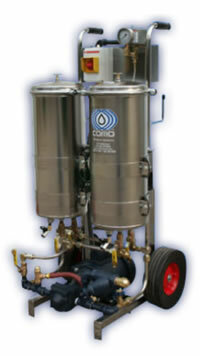 Since the Model 130 is portable, it can be easily moved through out the plant. Currently using only one case of filters (less $400) in the Model 130, they now recycle even more oil - about twenty drums (over 1,100 gallons) of oil each month. They have reduced new oil purchases as well as eliminated hauling off costs - for a savings of thousands of dollars per month.